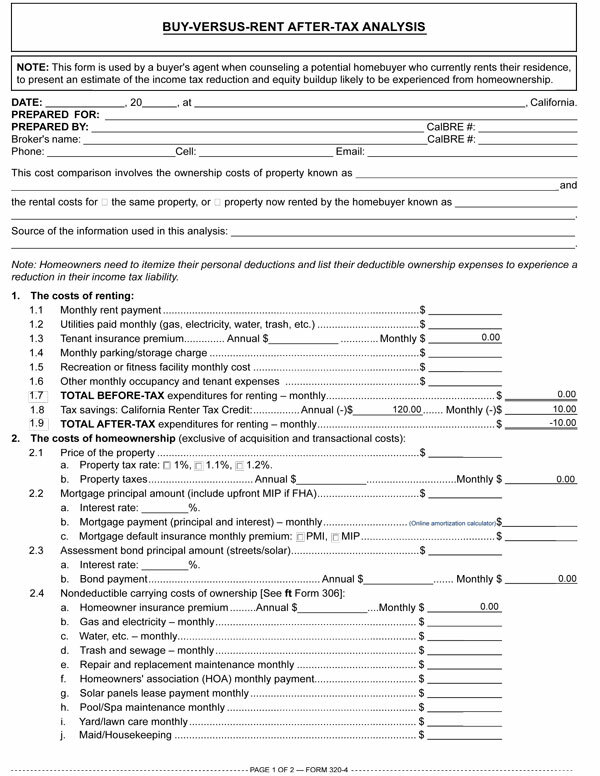 This form is used by a buyer’s agent when counseling a potential homebuyer who currently rents their residence, to present an estimate of the income tax reduction and equity buildup likely to be experienced from homeownership. The costs of renting: This section illustrates the total monthly cash outlay currently experienced renting shelter. The costs of homeownership: This section illustrates the total monthly costs of homeownership the buyer of a property will likely experience (exclusive of the transactional costs of acquisition). The monthly tax savings analysis: This section illustrates the total monthly after-tax expenditures for ownership. Additional year-of-purchase tax savings for mortgage origination: This section illustrates the total deductible year-of-purchase tax savings for mortgage origination costs. Article: When does buying make more sense than renting?